It shouldn’t come as a surprise that two animated television shows would be the first exposure a child—or, as it was in my case, a teenager—gets to queer representation. Kids’ cartoons aren’t there just yet when it comes to a wide array of out and proud queer relationships. This has a long history and many reasons, but I’m today I’m going to talk about that. No, today I’m focusing on how it is changing and how two shows in particular proved to be milestones from both a cultural and a personal perspective: Adventure Time and The Legend of Korra. Let’s start chronologically with Adventure Time (AT). Originally pitched to Nickelodeon but ultimately airing on Cartoon Network, AT has been pushing boundaries and charming audiences of all kinds since 2010. But you already know how much I love this series. After all, I’ve written over 60,000 words about it on this site alone. So yeah, Adventure Time, great show, full of fun and mysteries and heartfelt moments. 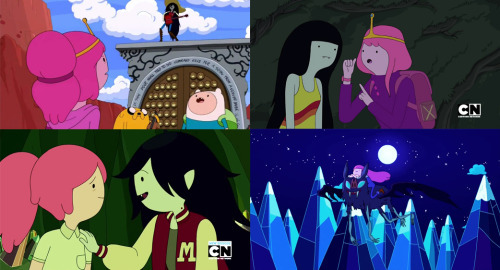 Another aspect of AT that earned it praise and the interest of many is the relationship between two main characters, Marceline the Vampire Queen and Princess Bubblegum. It’s strange to think about how the first signs of a romance between these two characters came in Season 3, back in 2011. The episode “What Was Missing” is to this day still my personal favorite for how it portrays a group dynamic, for its amazing songs, and for the scenes between Marceline and Bubblegum. Rebecca Sugar’s “I’m Just Your Problem” is still one of the most iconic songs in the show. It says more about the relationship the two characters had prior to the show than any long mono-/dialogue could. The song, the tension, and the eventual reveal about The Shirt™ kickstarted a beautiful dynamic. Later episodes like “Sky Witch” and at long last “Varmints” were also crucial in the development of the Bubbline relationships and led us to today. Today, with only one final episode left and Marceline and Bubblegum being basically together. “Varmints” especially is a strong contender for favorite episode as it works beautifully with what previous episodes built and resolves any and all issues Marcy and Bonnie still had. It allows them to reminisce about the past and opens up possibilities for a better future. It’s pretty damn perfect for the two of them. As happy as the development of Bubbline makes me and as much as I think it’s an amazing arc that needs a worthy conclusion, it still all comes back to “What Was Missing” for me. Because in 2011 Rebecca Sugar and Adam Muto created something special with that episode, went the extra mile to imply a past relationship that ended badly when the relationship had so much potential. 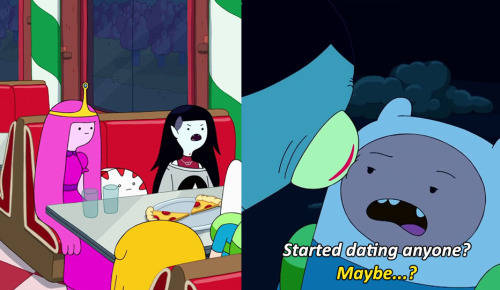 The fact that after this the Bubbline relationship was allowed to heal and move on to become even better and closer is amazing and there’s no denying how catchy and obviously full of love the new Marceline songs are. But. “What Was Missing” wasn’t explicit as such but it was groundbreaking. Sure, you could say “I’m Just Your Problem” was about the bad taste a lost friendship left, but come on. It was beautiful in such a unique way and my first experience with something that isn’t out and proud queer and yet still valid and created with care. It wasn’t even a particularly positive portrayal, as they start off disliking each other because of past baggage, but it was clear that there was more to it and that eventually it would be explored. “Sky Witch” aired in 2013 and “Varmints” in 2015 so it did take time, but it was all worth it. Grey’s Anatomy’s Callie and Arizona was the first wlw couple I can remember from the media I consumed, and that was strangely exciting to see. But a cartoon gum and an angsty vampire arguing about how they both felt wronged and bitter about it on Cartoon Network? Oh boy, did that feel real. While Adventure Time was taking its time giving us gradually more Bubbline, The Legend of Korra (LoK) was also airing between 2012 and 2014. 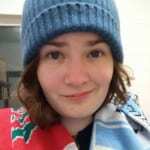 As a fan of the original Avatar: The Last Airbender show I was lucky enough to follow each episode of LoK as it came out and be engaged with the fandom. This meant many things, from theories to shipping fatigue. Around the time Book 3 started in early summer of 2014, though, it was pretty good to be part of that community and watch it with people. Two reasons for that were that Book 3 was a general highpoint in the series and that Korrasami began. Correction: Korrasami began when the character of Asami Sato was announced a couple of months before the show premiered and had a decent though not particularly significant following through Books 1 and 2. What I mean is that Korra and Asami started hanging out and acting like real friends and forming a deep bond when Book 3 started. And it was glorious in so many ways and such a relief after all the love triangle drama in previous books. Not that the two were ever true rivals (Korra’s initial dislike of Asami quickly disappeared once they had a one-on-one scene together) but now they had a genuine relationship. Bubbline has its fair share of attention on this site but I don’t think anything compares to the sheer amount of love that Korrasami gets from The Fandomentals, and rightly so. Because of this, I don’t think I need to detail why they are or important or why they are loved. Instead, let me tell you this: I love them because their relationship developed just like my feelings about them did. Gradually, from (viewing it as) a friendship to something more. I went into Book 3 not daring to expect this much screen time with the two of them but thoroughly enjoying it. Every scene proved how they should have done this sooner and how well they worked together. Initially, I loved it because of the subversion of expectations when it comes to two girls who were involved with the same guy. It then became not just a “we’re on good terms” but a “you can always count on me” kind of friendship. By the time the finale rolled around, I was shipping it without really shipping it. By which I mean I was loving their scenes and the subtext and wanted more but never thought it could ever develop into a romantic relationship. I didn’t think I could afford to love them like that; they were ‘never gonna go there’ anyway, so I was satisfied with what we had. I also think that back then I was just glad we got to see this amazing dynamic and felt like that in itself was more than I ever hoped for. Book 4 changed things, developed them further. The first major sign was “Korra Alone” and the letter scene, and though I was starting to gush about it to people, I still didn’t want to believe it. It took until “Reunion” for me to declare myself a shipper, as it were. I still didn’t believe Korrasami would ever become canon in that they would get together, but I loved them so much that I didn’t care about that anymore. Maybe it was never gonna happen and maybe people were right calling the shippers deluded, but I didn’t care anymore. I loved them and therefore it was valid to me. Except, shippers weren’t deluded. The signs were leading up to something, so when I sat down to watch the two final episodes on that December day, I was kind of hopeful but ultimately decided that I would not be disappointed no matter what. The last scene was everything I never knew I needed. It felt unambiguous to me and yet the creators’ posts a few days later came a close second to the pure euphoria that the actual scene caused. And to this day I love looking back on 2012 to early 2014 Korrasami posts of mine because I never could have imagined and yet I hoped. To love the dynamic you’re seeing and hope for it to turn out a certain way is something; to have it validated by the creators and shown onscreen is something else entirely. And look, I get it, Korrasami is not immune to criticism. Censorship or not, arguably they could have done slightly more when it came to the build-up, started developing it sooner, et cetera. It wasn’t perfect, but it happened. And it wasn’t only a milestone for kids’ television but also a personal one, because suddenly a deep friendship between girls could become something else. It was valid, it could happen. Not only that, but I clearly wasn’t alone in picking up on the signs. I already mentioned Grey’s Anatomy and there were a couple more minor roles I saw on TV or occasionally in movies, but Adventure Time and The Legend of Korra were the first two shows that I cared deeply about to begin with and then they went on to create these fascinating dynamics between female characters. I truly believe that both AT and LoK are outstanding in what they did to explore these relationships. Rebecca Sugar left Adventure Time to create Steven Universe, and look at how unapologetically queer that show is! That needed Sugar’s work on AT and Korrasami though. It’s been four years since The Legend of Korra ended and it’s easy to dismiss but things are changing. It’s not just Steven Universe, look at shows like Voltron or The Loud House and countless other kids’ animation that’s willing to take that extra step now. 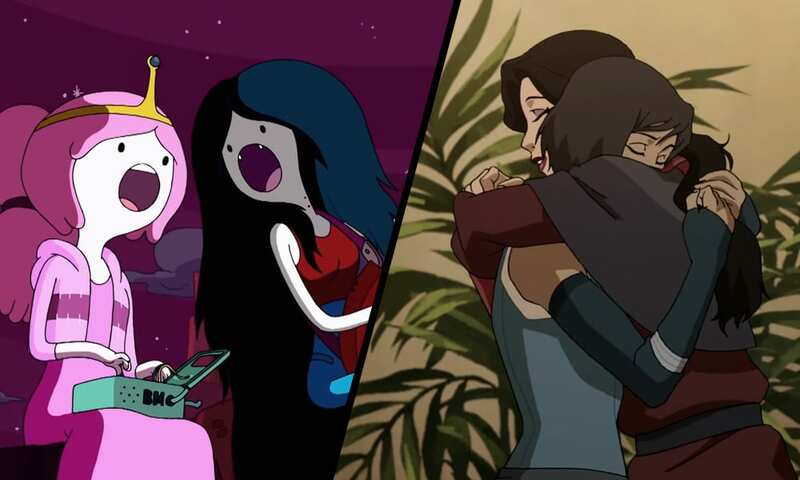 Still, what makes both Bubbline and Korrasami special is not only that they were my firsts but also that they are based on genuine connections between characters who happen to be the same gender. It’s not just about representation, it’s about being willing to follow through on character arcs and letting them grow naturally. It’s about questioning why creators wouldn’t be able to bring two characters together if it makes sense. After all, that’s one of the reasons why representation matters: to normalize. After all this I have only one wish regarding these couples. No matter what you thought of the LoK finale, Korrasami was confirmed to be canon and just concluded their first comic trilogy. Though the comics are, again, not perfect, they are allowed to be a couple unambigously. Bubbline, however, is still in a will-they-won’t-they position as of this moment. That is, whether the creators will or will not go for it and make it gay. So close yet not quite there. I had an interesting conversation with my housemate about this topic when I was considering writing about it, and I think she summed it up pretty well: at this point, Adventure Time needs to follow up on its own legacy. I am grateful for all that we’ve gotten in regards to Bubbline, but they need to make a first step once again. The fact that they’re basically together is not enough anymore. AT had a hand in allowing Korrasami and all those other queer aspects of kids’ shows to happen. It only seems right that they should say goodbye with queer couple. They’ve been teasing it long enough. Plus, Korrasami or not, 15 year-old me would still feel most validated by the revelation, the actual confirmation that yes, Marceline was singing about romantic love. That would make my first queer experience unashamedly and unarguably, well, queer. Well hello, my name is Szofi, which is just a variation of Sophie. Currently a university student living almost 1000 miles from home and building a life there.